Built for fun. Built with Pride. Who knew that so many good times were born in the all-American town of Katy, TX? Touchdowns, birthdays, fishing trips and water breaks. Whether it’s sharing life’s milestones or just sharing the events of the week. 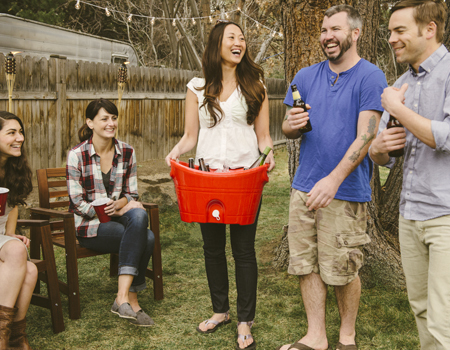 Igloo has been helping folks pursue happiness for almost 70 years… and it all starts right here with people. People with more than 2000 years of experience on a campus in Katy, TX. People who believe in what they’re doing. People who take pride in what they make. For us it’s not an ice chest, or a water jug. It’s about landing the big one, connecting with friends and family, or building the next great American city. It’s about producing a quality product that makes the good times better and won’t let you down when you need it most. If you think you could be one of those people and you want to join us in making the essential equipment for a good time, you’re in the right place and we’re hiring. Igloo Products Corp. is an Equal Opportunity Employer. As we approach our next century, Igloo is 1200 employees strong. We are proud to call—a 1.8 million square-foot, three-building facility in—Katy, Texas home. With more than 500 products sold at hundreds of retailers around the globe, we can confidently call ourselves the number one cooler manufacturer in the world. And through it all we haven’t lost sight of our original goal—to create products that enable the pursuit of happiness (however you define it). That’s why we’re still working hard every day to innovate, create, and make it easier for you to get out, work hard and play even harder. © 2019 Igloo Products Corp.